Permeable pavement is a porous urban surface which catches precipitation and surface runoff, storing it in the reservoir while slowly allowing it to infiltrate into the soil below. This study will evaluate how well different types of permeable pavement reduces the amount of pollutants and runoff volume. Urbanization of the landscape has an appreciable negative impact on the quantity and quality of runoff water entering our lakes and streams (Davis, 2005; Wang and others, 2001; Williamson, 1993). By replacing natural land covers (like grasslands and forests) with impervious surfaces (like parking lots and streets), we lose the water retaining role of the soil and vegetation. Increased runoff from impervious surfaces causes dangerous floods, severe erosion damage to our stream channels, diminished recharge of groundwater, and degraded habitat for our fisheries. These same impervious surfaces can transport the many pollutants deposited in urban areas, such as nutrients, sediment, bacteria, pesticides, and chloride. In the worst cases, the amount of pollutants in urban runoff are high enough to prevent us from being able to swim or fish in our local waters. Efforts to reduce the impacts of urban runoff have been happening for some time at federal, state, and local levels. The Clean Water Act (CWA) is the primary federal law that regulates the quality of the nation’s water bodies. The CWA, through the National Pollutant Discharge Elimination System (NPDES) program, establishes pollution limits for anyone discharging into streams and lakes, including cities. In Wisconsin, NPDES permits are issued by the Wisconsin Department of Natural Resources (WDNR) which identify performance standards and limits for things like peak flow, runoff volume, phosphorus, and total suspended solids. As part of their permit, each city must prepare a management plan to meet these prescribed limits by implementing best management practices (BMPs). BMPs are practices, treatments, and technologies that can alleviate one or more if these negative effects. Permeable pavement is one of these BMPs that is believed to improve water quality and reduce the impacts of urban runoff. Permeable pavement is a porous urban surface composed of open pore pavers, concrete, or asphalt with an underlying stone reservoir. Permeable pavement catches precipitation and surface runoff, storing it in the reservoir while slowly allowing it to infiltrate into the soil below or discharge via a drain tile. The most common uses of permeable pavement are parking lots, low-traffic roads, sidewalks, and driveways. Figure 1. Installations of the three test pavement types: permeable pavers, permeable concrete, and permeable asphalt. What are the Potential Benefits of Permeable Pavement? Permeable pavements help reestablish a more natural hydrologic balance and reduce runoff volume by trapping and slowly releasing precipitation into the ground instead of allowing it to flow into storm drains and out to receiving waters as effluent. This same process also reduces the peak rates of discharge by preventing large, fast pulses of precipitation through the stormwater system. Permeable pavement can reduce the concentration of some pollutants either physically (by trapping it in the pavement or soil), chemically (bacteria and other microbes can break down and utilize some pollutants), or biologically (plants that grow in-between some types of pavers can trap and store pollutants). By slowing down the process, permeable pavements can cool down the temperature of urban runoff, reducing the stress and impact on the stream or lake environment. By controlling the runoff at the source, such as a parking lot, permeable pavement can also reduce the need for or the required size of a regional BMP, such as a wet detention pond, which saves money and effort. Another benefit of permeable pavement is the reduced need to apply road salt for deicing in the winter time. Researchers at the University of New Hampshire have observed that permeable asphalt only needs 0 to 25% of the salt routinely applied to normal asphalt (Houle and others, 2009). Other researchers have found that the air trapped in the pavement can store heat and release it to the surface, promoting the melting and thawing of snow and ice (Roseen and others, 2012). Durability – Will permeable pavement last as long as traditional pavement? Upkeep and maintenance – Permeable pavement can clog with sediment and pollutants, reducing its permeability and beneficial productivity. How much effort is required to keep permeable pavement functioning? What is the frequency of maintenance needed to maintain design life of the pavement? What is the potential for groundwater contamination by infiltrating water treated by permeable pavements? What is the quality of water discharged from a permeable pavement drain tile? Temperature – What temperature reductions can be expected with permeable pavement? Residence time – How long does the runoff need to stay in the storage layer to adequately treat the runoff? Model accuracy – How well can existing urban runoff models predict the water quality benefits of permeable pavement? Determine how quickly permeable pavement clogs with fine particulates over time thereby slowing the infiltration rate. Calculate the residence time of the runoff collected in the storage layer during different precipitation events. Test how permeable pavement can cool heated runoff during summer months. Test how permeable pavement surfaces can reduce the need for road salt. Improve permeable pavement routines in the Source Load and Management Model (WinSLAMM*) using data collected from the study. Provide results that will help the Wisconsin Department of Natural Resources amend their WDNR Conservation Practice Standard 1008 for Permeable Pavement. Figure 2. Installations of the three test pavement types: permeable pavers, permeable concrete, and permeable asphalt. Figure 3. Location of study area (represented by the red circle); Madison Streets Division East Office, overflow parking lot in Madison, Wis.
A small portion of green space, adjacent to the overflow parking lot serving the Madison Streets Division’s East Office, in Madison, Wis., has been designated as the study location (fig. 3 and 4). The white study area shown in figure 4 is split equally into three smaller study plots, each receiving similar volumes of runoff from the adjacent parking lot. These plots will test three types of pavement: permeable pavers, permeable concrete, and permeable asphalt (fig. 5). Each plot is equipped with instrumentation to measure reductions in runoff volume (water quantity) and pollutants (water quality). Figure 4. Aerial view of study area showing the locations of equipment and test-plot installations. Figure 5. Completed installation of test plots: permeable pavers (foreground), permeable concrete (midground), and permeable asphalt (background). Runoff from the parking lot flows toward an existing curb cut, which is equipped with a calibrated flume. Runoff enters the flume and drains into a concrete structure that divides the runoff into three equal portions, each draining to one of the three test plots (fig. 5). The runoff either infiltrates into the permeable subsurface or exits the plot as overflow runoff. Each test plot is lined with an impermeable membrane, which captures and routes infiltrated runoff through a buried drain tile (fig. 6). Runoff that does not infiltrate into the permeable surface is captured by an overflow surface grate. The test plots are constructed to prevent cross-contamination from adjacent test plots and surrounding soils. Both the drain tile and surface grate are routed into a monitoring facility, where the volume of infiltrated and overflow runoff is captured separately (fig. 7). The monitoring facility accurately measures all inputs and outputs of water using calibrated flumes. Figure 7. Monitoring facility used to measure water that both infiltrates through and runs off each test plot. Ancillary data will also be collected, including, but not limited to: precipitation, sand/salt application during winter months, runoff temperature at depth, and a record of maintenance. This permeable pavement test site will be operated and maintained through 2018. Davis, A.P., 2005, Green engineering principles promote low-impact development: Environmental Science and Technology, A-pages, v. 39, no. 16, p. 338A–344A. Houle, K., Roseen, R., Ballestero, T., Briggs, J., and Houle, J., 2009, Examinations of Pervious Concrete and Porous Asphalt Pavements Performance for Stormwater Management in Northern Climates: World Environmental and Water Resources Congress 2009: p. 1–18. Roseen, R., Ballestero, T., Houle, J., Briggs, J., and Houle, K., 2012, Water Quality and Hydrologic Performance of a Porous Asphalt Pavement as a Storm-Water Treatment Strategy in a Cold Climate: Journal of Environmental Engineering, vol. 138, no. 1, p. 81–89. Wang, L., Lyons, J., Kanehl, P., and Bannerman, R., 2001, Impacts of urbanization on stream habitat and fish across multiple spatial scales: Environmental Management, v. 28, no. 2, p. 255–266. Improved permeable pavement design capabilities for engineering consultants who use the Source Loading and Management Model (WinSLAMM*) for water quantity and quality characteristics as part of state or local permit compliance. Quantifying the benefits of permeable pavement in reducing the amount of runoff and pollutants entering our streams and lakes. Quantifying the amount of road salt needed to keep permeable pavement snow- and ice-free during winter conditions. Providing information about the maintenance and upkeep requirements for permeable pavement. Provide results that will assist the Wisconsin Department of Natural Resources update their technical standard for permeable pavement, which will help Madison and other municipalities incorporate permeable pavement into their management plans. 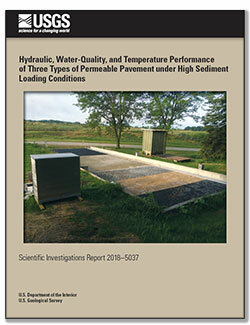 The findings of this study are now available in USGS Scientific Investigations Report 2018-5037 Hydraulic, water-quality, and temperature performance of three types of permeable pavement under high sediment loading conditions. Selbig, W.R., and Buer, Nicolas, 2018, Hydraulic, water-quality, and temperature performance of three types of permeable pavement under high sediment loading conditions: U.S. Geological Survey Scientific Investigations Report 2018–5037, 44 p., https://doi.org/10.3133/sir20185037.